Ensuring the health of your citizens is important if you want your citizens to enjoy living in your city. Healthcare services will help you keep your citizens more healthy and take care of the sick. "Hospitals" and "Medical Clinics" have ambulances that will pick up and transport sick people back to the hospital or clinic for treatment. If an ambulance is not available at the moment, the citizens may try to walk to the closest clinic or hospital. Hospitals have helipads on the roof that Medical Helicopters can land on to deliver patients. Clinics can receive patients via helicopter as well; they will land on the ground in front of them. The "Medical Laboratory" is from the Content Creator Pack: High-Tech Buildings DLC. It functions as a hospital with no ambulances. Patients may arrive on foot, in their own vehicle, or by Medical Helicopter landing in front of it. The "Medical Center" monument is a facility that works on finding cures for diseases and ailments. It is so vast and efficient that it can easily take care of all your citizens' health needs. The Medical Center has a helipad and accepts patient deliveries via Medical Helicopters. Some buildings provide a health boost in the area around them. They do not have ambulances or accept any patients. Available only with the Snowfall DLC enabled. The "Sauna" provides a small health boost over the area it covers. It may be used on snow or non-snow maps. Available only with the Green Cities DLC enabled. The "Sports Hall and Gymnasium", "Community Pool" and "Yoga Garden" all provide a small health boost to the surrounding neighborhood. Available only with the Natural Disasters DLC enabled. The "Medical Helicopter Depot" is from the Natural Disasters DLC. Up to three medical helicopters can operate from each depot, picking up sick cims around the city and dropping them off at a hospital, clinic, Medical Laboratory or Medical Center. Each one flies for a shift that can have up to five patient deliveries, and then returns to the depot. They will return to the depot before the end of their shift if there is no immediate call for them. Medical helicopters will land on helipads on top of buildings when available, otherwise they will land in the street in front of buildings. They do not block traffic, as vehicles simply pass through them. Medical Helicopters can reach areas that have no road access for ambulances, due to city design, road flooding or road collapses from disasters. There are some policies that can have a direct impact on citizen's health. The "Anti-Slip Studs" policy increases the health of elderly citizens by making them less likely to slip on icy streets. The "Smoking Ban" policy results in slightly increased health. Indirectly, any policy that reduces noise can potentially reduce the number of sick citizens, as noise is a common cause of citizen illness. Pollution reducing policies, such as "Filter Industrial Waste", may also reduce the number of sick citizens. In a city full of life, death will eventually face the sick and the old. Deceased citizens need to be transported to cemeteries and crematoriums where they will be taken care of. Cemeteries and Crematoriums provide your city with hearses that transport the dead to one of the aforementioned services. If a corpse is not picked up within a certain time period, the building will eventually be abandoned. When a cemetery runs out of room, it can be emptied in the same logic as landfills. When set to emptying mode, the hearses will start moving the corpses to crematoriums, or to other non-full cemeteries if a crematorium is not available. Unfortunately, some (very few) hearses will empty into other non-full cemeteries, even though crematoriums are present and have the capacity to process the dead. Crematoriums have an interesting characteristic in that they can burn far more corpses per week than their own 7 hearses can collect, normally a crematorium will burn 20-40 corpses per week, but if a cemetery set to 'empty' is delivering corpses a crematorium can burn 160-200 corpses per week. This makes it economical to empty and refill cemeteries as cemeteries are much cheaper per hearse than crematoriums, and one crematorium can service several cemeteries. The Cryopreservatory is from the Content Creator Pack: High-Tech Buildings DLC. It is described as a facility for freezing the dead to preserve them until the technology to revive them becomes available. In-game it is functionally identical to a crematorium, but with more hearses and capacity. City statistics view. A 2021 deathwave is the large spike in the death rate (red). Later, a cyclical patten in birth (yellow) and death rates emerges. 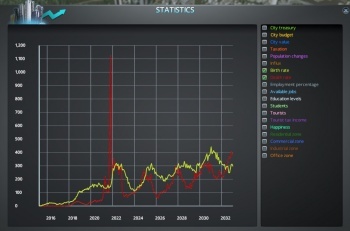 In the Cities:Skylines community, the term "deathwave" is used to describe a cyclical phenomenon where a large number of deaths occur within a city near-simultaneously, putting considerable strain on the deathcare services. Citizens in the game have short and rather uniform lifespans of about 6 years. If cities are expanded rapidly very early in the game, this results in a large proportion of citizens of almost exactly the same age, resulting in a deathwave six years after the city's foundation. Cities will often develop such a cyclical pattern in their age profiles. This behaviour can cause a strain on the city, most notably during periods of high death rates where deathcare services are stretched. Such deathwaves can be weathered, either by investing in a substantial deathcare infrastructure, or by demolishing buildings that are abandoned due to uncollected corpses. The best way to avoid deathwaves is to expand a city (especially its residential zones) gradually, producing a more even population pyramid. There must be road access for the hearses. A new part of the city may not yet have a road connection, or a disaster could destroy a section of road. A one-way street can prevent access. If the number of cims dying is greater than the amount being collected, new deathcare facilities should solve the problem. A full cemetery will obviously not collect any dead. Check Deathcare in the info view panel. Excessive traffic may block hearses and delay pickup long enough for cims to complain and move out. A mod may cause the problem. If you are using mods, try loading the game with NoWorkshop. Can only be moved or demolished when empty. Community Pool Busy Town 75,000 1,200 0 0 960 480 6×6 Health benefit to area. Cryopreservatory Big City 32,000 800 0 0 320 640 4×4 Effectively equivalent to a larger Crematorium. Medical Helicopter Depot Boom Town 50,000 1,200 0 15 128 720 13×9 Picks up patients and delivers them to a hospital, clinic or Medical Laboratory. Medical Laboratory Busy Town 42,000 1,280 0 0 640 960 10×6 Clinic without ambulances. Patients can walk in, or be delivered by helicopter. Sauna Big Town 25,000 400 0 0 240 240 3×4 Saunas create a health bonus to the neighborhood around them and increase happiness. Sports Hall and Gymnasium Tiny Town 120,000 2,400 0 0 640 960 6×8 Health benefit to area. Yoga Garden Small City 90,000 1,600 0 0 480 320 4×5 Health benefit to area. This page was last edited on 27 January 2019, at 23:05.